Inflation is not the headline story of 2011; albeit a few glaring monthly readings due to higher food and energy prices are possible. On what grounds can we be sure of this claim? First, the current readings of inflationary measures are below levels consistent with price stability. The FOMC's preference is 2.0% or slightly below 2.0% inflation readings. As shown in Chart 1, inflation measures have posted gains below 2.0% in recent monthly reports and projected growth of the economy in 2011 suggests a benign inflationary environment. Significantly higher inflation in 2011 from the current level is not in the cards for these reasons. First, actual real GDP of the economy is far below potential GDP. 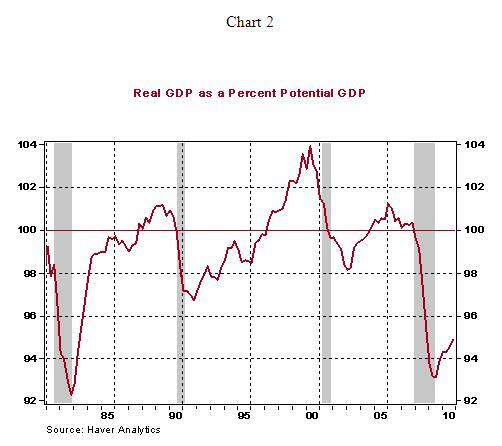 Compared with the Congressional Budget Office's estimate of potential real GDP of the economy, real GDP of the U.S. economy was roughly 5.0% below potential real GDP in the fourth quarter (see Chart 2), which makes a compelling case for contained inflationary environment. Second, capacity utilization at the nation's industries stood at 76% in December compared with the historical average of 79.7% (see Chart 3). 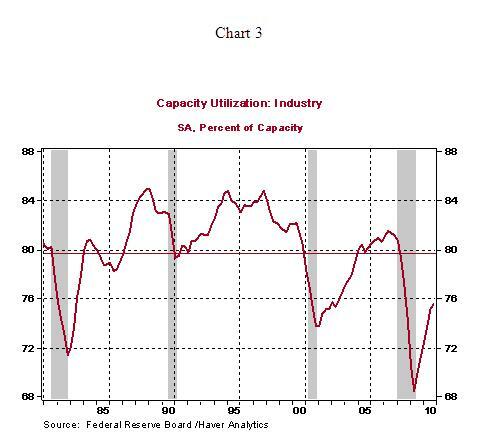 Capacity utilization of the labor force is at a historically low level. 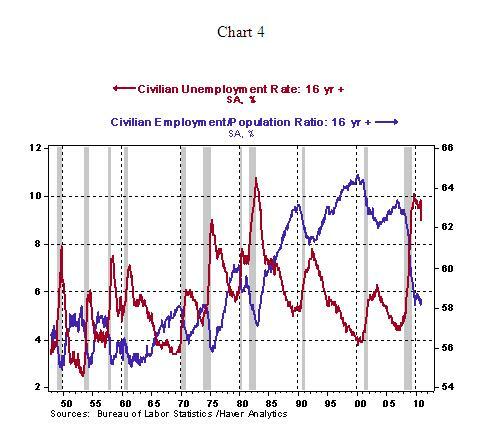 The 9.0% unemployment rate of January (see Chart 4) is far cry from the full employment level of the economy. Third, unit labor costs declined in 2009 and 2010; two consecutive annual declines of unit labor costs represent a historical record. 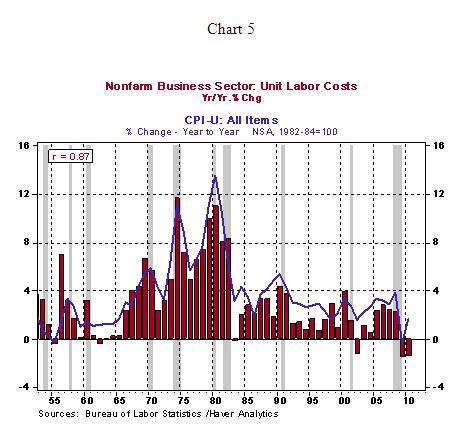 Unit labor costs have a significant positive correlation with change in the Consumer Price Index (see Chart 5). Expectations of future growth in 2011 are not indicative of a sharp increase in unit labor costs. 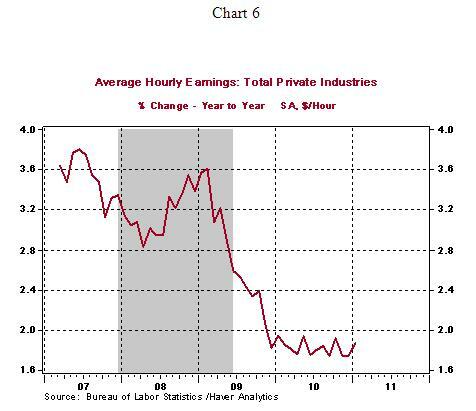 Fourth, hourly earnings rose only 1.9% from a year ago in January and outstanding gains in hiring are unlikely in 2011. Therefore, rising labor costs translating into sharply higher prices is implausible, at the present time. 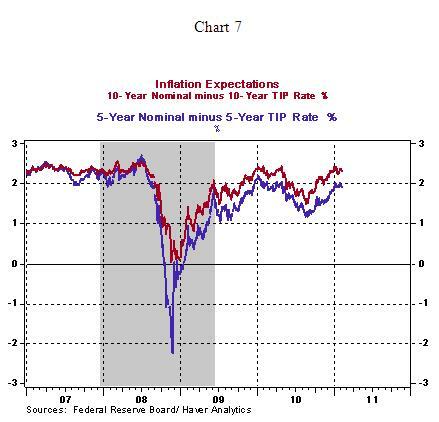 Last but not the least significant, inflation expectations (see Chart 7) have moved up to positive territory after extraordinarily low readings in the deepest phase of the financial crisis. The behavior of inflation expectations is very important because it is a forward looking indicator which shapes the course of monetary policy. 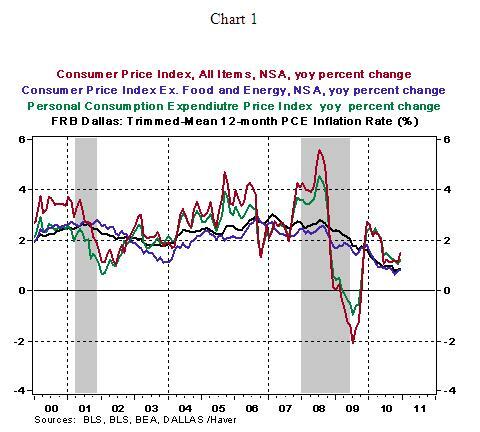 For all these reasons, inflation is not the market moving event of 2011. But, it is necessary to bear in mind that overall inflation in 2011 should be higher than readings seen in 2010. Also, higher food and energy prices raising the headline number is entirely possible. In sum, the hawks in the FOMC will not have much support if the above discussed factors continue to present an inflation friendly environment in 2011. 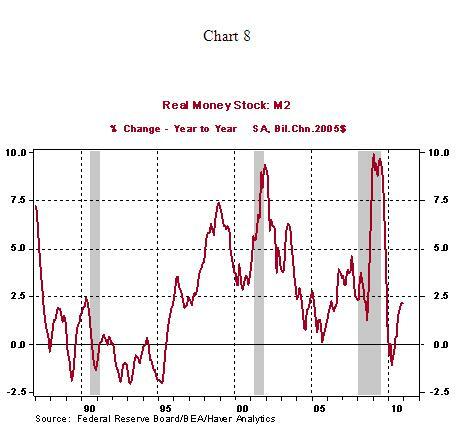 For the advocates of money supply measures as indicators of inflation, the latest real M2 numbers are also not indicative of impending inflation in the economy (see Chart 8).